Razer Announces Megalodon Gaming Headphones | OhGizmo! I am an avid PC gamer and when I play, I always use headphones. I use headphones because they don’t disturb the people in my home and it helps block out the noise in the environment that disturbs my play. Typically, when I play I use a set of Razer Barracuda headphones that provide very good surround sound audio quality. Razer has introduced what may be my next set of headphones called the Megalodon 7.1 surround sound gaming headset. 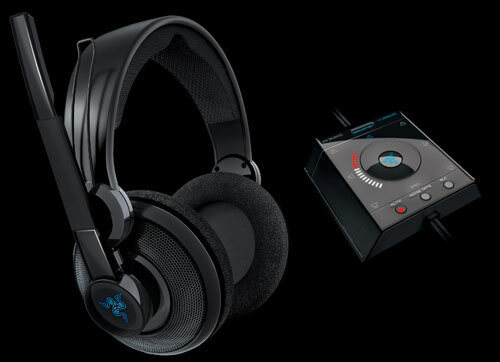 The headset uses Razer’s new Maelstrom Audio Engine to process positional audio cues 800% faster than comparable virtual surround sound systems according to Razer. The Megalodon headset will retail for $149.99 when it goes on sale in Q4 2008 worldwide. The headset features a mic for in game voice chat the uses a unidirectional pickup pattern. The audio processing unit of the headphones features controls for master volume, center volume, front volume, side volume, rear volume, bass level, mic sensitivity, mic level, mic mute/test and more. The headphones connect to the PC with a single USB connection. That means that the headphones won’t offer true surround sound. If you don’t mind the extra coin, spring for a set of Astro A40s from Astro Gaming. You’ll never game the same way again.